TimeCard Standard is a straightforward piece of software that lets you track time and attendance information, as well as calculate regular, benefit and overtime hours for your employees. Furthermore, the program records the hours employees were not at work and automatically calculates the benefit hours earned by employees. 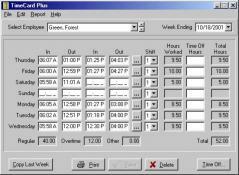 TimeCard Standard allows multi-user access, which means multiple users can access and edit the data at once. The application is capable of generating detailed and summary reports for hours worked and time off hours for selected employees and a custom time period. On top of that, you can print a report for benefit balances which you can give to your employees so they can see how much time they’ve taken and the time they have left for each benefit.